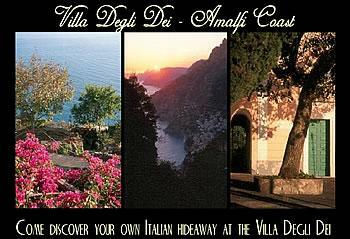 Four-hundred fifty meters above sea level of the Amalfi Coast sits Nocelle - a precious, pastoral village - a mountaintop paradise - home to Villa Degli Dei. In Nocelle there is a sense of being in the hands of the gods, looking down from their post on high, as all of their watery playground spreads far and wide below them. Breathtaking beauty stretches as far as the eye can see - from the Faraglioni of Capri to the edge of the shining sea and down to the picturesque beach village of Positano. In the midst of this rich Italian glory is the Villa Degli Dei, �the house of the gods�. Birth home to the owner, one of the original families of Nocelle, he has now opened the doors wide to welcome guest from the world over. Completely renovated in 2002, Villa Degli Dei offers an internal world of modern comforts with an exterior authentic and antique. Our lovely six-room accommodation lends an elegant yet quaint charm to the rustic and rural village life of Nocelle. This mountaintop paradise affords direct access to a world class hiking trail, the Sentieri Degli Dei (the path of the gods), which traverses eleven kilometres of awe-inspiring peaks reaching towards the heavens, while still being only a thirty minute ride down to Positano - a world famous resort town with restaurants, shopping , sunning and nightlife. Come discover your own Italian hideaway at the Villa Degli Dei!